Please Note: By IFSC Code is necessary for NEFT Transaction if you are doing payment online from your net banking account of any net enable Indian bank. Mira Road (E) - 401107, Dist. Thane, Maharashtra,India. Cheques non-payable at Mumbai will not be credited to your account immediately but only after the amount has been credited to our Bank Account. Demand Drafts or Pay Orders or Cheques payable in Mumbai will be credited to your account within 2 Business day and outstation Cheques will be credited to your account within 5 days. You need to pay EXTRA Rs. 75 for outstation Cheque. Please Note: The order will be processed only when we receive payment or money will be added to our bank account or after successful clearance of cheque . Payments made in time ensures prompt and efficient delivery of Services. PAY TO UPI ADDRESS " PUSHTIWEBINDIA@UPI"
Money will be transfer to our BOI Current Account - Pushti Web and Software Solutions, 012020110000307. You can download the BHIM app from the Google playstore. 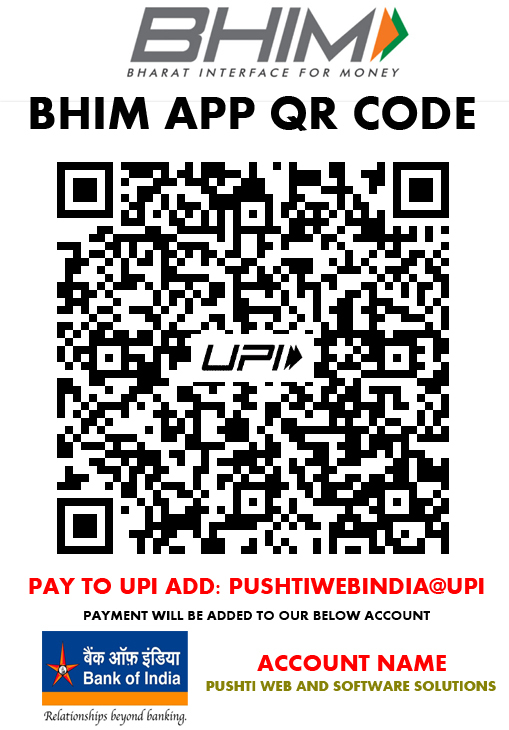 Since, UPI system works on the Android platform, you would not find BHIM app for iPhone or windows phone. However, in future, you would expect the BHIM app for iPhone as well. To get the BHIM app from the Google playstore search for ‘BHIM by national payment corporation of India’. Beware, as there are many fake apps in the name of BHIM. You may also see the Chhota Bheem apps. Hence look for the author. It should be ‘National Payment Corporation of India’. You can also use the following URL to directly download BHIM app. Like any other android app, The BHIM gives an easy method of payment and fund transfer. It has the following basic features of a UPI app. You can transfer fund to any bank account. You don’t need to register the payee beforehand. You don’t need to know the bank account number of the payee. Besides the regular features of a UPI app, the BHIM has some unique features. Through the BHIM app, you can transfer money to a person only using his mobile number. It makes the money transfer very easy. Besides UPI PIN, you would be able to authenticate the fund transfer using your fingerprints. This app would also work on feature phone without internet. There is ‘Scan and Pay’ facility. It makes the payment transfer fast, specially at a shop. There is a extensive FAQ about the app. It makes BHIM app very helpful to novice users. You can easily download and share your QR code. This code can be used to pay to you. In its second update BHIM has included some cools features. Now BHIM app is available on 9 different language. You can choose one. You can also use the Aadhaar number to transfer money through this app. However the Aadhaar of the beneficiary should be linked to a bank account. You can also report any issue through this app. For Bank of India (BOI) Net Banking Transaction, Please mention your Payment Transaction ID and details of transaction on sales@pushtiwebindia.com otherwise We will not acknowledge the payment and this may result in the loss of your funds. Please Note: We DO NOT accept CASH deposits in any of our Banks. We will not acknowledge the payment and this may result in the loss of your funds. To know our bank account details, kindly send your request mail at sales@pushtiwebindia.com or Call Proprietor - Gaurang Goradiya on 9324278325 / 90227 49633. For ICICI Net Banking Transaction, Please mention your Payment Transaction ID and details of transaction on sales@pushtiwebindia.com otherwise We will not acknowledge the payment and this may result in the loss of your funds. We encourage all our Resellers who choose PayPal to add funds, to use only a Verified PayPal Account. Using a Verified PayPal Account does not require any verification from our end. What's more, the funds get credited to your Account instantly, without you having to raise a Support Ticket or show us verification documentation! Though we encourage only Verified PayPal Accounts, there might be times when you need to urgently Add Funds to your Account and can't wait to Verify with PayPal. In such cases, we can use the Quick Authentication Process which will authorize the particular Unverified PayPal Account Transaction. Though we encourage only Verified PayPal Accounts, there might be times when you need to urgently Add Funds to your Account and can't wait to Verify with PayPal. In such cases, we can use the Process which will authorize the particular Unverified PayPal Account Transaction. To know our paypal account details, kindly send your request mail at sales@pushtiwebindia.com or Call Proprietor - Gaurang Goradiya on 9324278325 / 90227 49633. You can send us payment by cash at our office in MiraRoad (E). Send your Company representative Or Worker for Cash Payment.